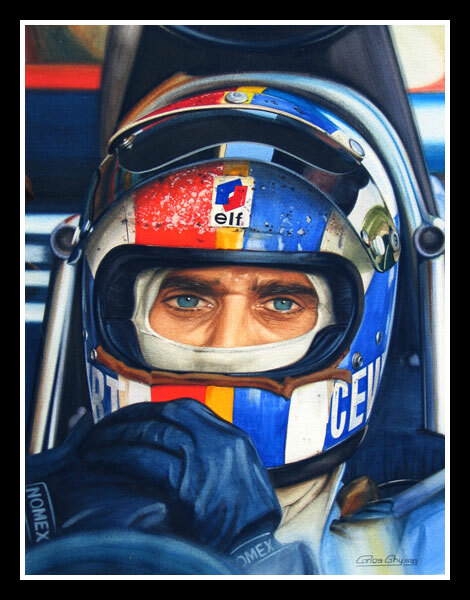 Extrovert, charming and blessed with dazzling good looks, Fran�ois Cevert was put on earth to be a racing driver. After enjoying considerable success in both F2 and F3, he was recruited to Formula 1 by Ken Tyrrell to partner Jackie Stewart early in 1970. The bright-eyed young Frenchman proved a willing disciple of Stewart. By the summer of 1971 he was good enough to take second place behind Jackie Stewart in the French Grand Prix and, with only a little luck, picked up a momentous victory at Watkins Glen later that year. Reckoned by some to be good enough to land a top drive elsewhere, Cevert remained an integral part of the Tyrrell family through 1972 and into 1973. It was Ken's plan that Cevert would inherit Stewart's position as number one driver when Stewart retired. Sadly, that transition never happened. Battling with Ronnie Peterson for a front row starting position at the Glen, Fran�ois Cevert was killed in a violent accident, and France had to wait for more than a decade before acclaiming its first World Champion.